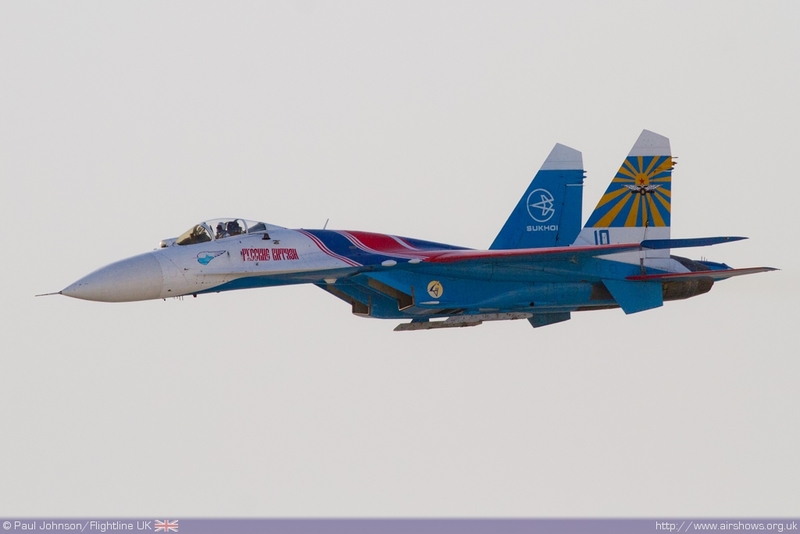 Airshow organisers Farnborough International Ltd are pleased to confirm that two of the Russian Knights’ Su-27s will be appearing at the Farnborough International Airshow. With just three weeks to go until the public weekend, this news is a great addition to an amazing five hour flying spectacular taking place on Saturday 14 and Sunday 15 July 2012. The Aircraft will be on display for the full seven days of the show, one will be on static display while the other will be displaying its awesome capabilities in the sky. Their only appearance in the UK this year, this is a rare opportunity to see this amazing fighter aircraft built by Sukhoi. Entertainment is high on the agenda at the Farnborough Airshow with aerobatic display teams aplenty. The Breitling Jet Team, The Blades, RedHawks, Breitling Wingwalkers and of course the RAF Red Arrows will fly over the skies of Farnborough aerodrome performing stunts and tricks with speed and precision that visitors always enjoy. The solo displays will also be enhanced by the first appearance of a South Korean Air Force T-50 jet trainer in the colours of the Black Eagles display team and the exciting unlimited aerobatics of Mark Jefferies. For the enthusiasts there are a whole host of military aircraft flying and on static display including the Boeing F/A18 Super Hornet, the Lockheed Martin F-16 Fighting Falcon and C-130J Super Hercules and the Yak-130. During the weekend, military greats from the Battle of Britain Memorial flight and Avro Vulcan XH558 will also be flying. Visitors will also be among the first to witness the future of space travel with Virgin Galactic who will be presenting a full-scale model of SpaceShipTwo at the Farnborough Airshow. The world’s first ‘spaceline’, it will be able to offer passengers the opportunity to experience sub-orbital travel.